Luis Buñuel announced that his 1970 effort, Tristana, would be his final film, feeling he was beginning to repeat himself. When he expressed this sentiment to screenwriter Jean-Claude Carrière, they began talking at length about the topic of repetition. This led to Mr. Buñuel meeting with producer Serge Silberman, who told him of an interesting anecdote. He had forgotten about a dinner party and was subsequently surprised when he found six hungry friends appear on his doorstep. This story was enough to bring Mr. Buñuel out of retirement, and Mr. Silberman agreed to give him $2,000 in advance to write a new script alongside Mr. Carrière. Like The Exterminating Angel before it, The Discreet Charm of the Bourgeoisie is a scathing social critique on the hypocrisy and insipidness of the upper-middle class. One scene that exposes this is when they angrily throw out a bishop wearing their gardener’s clothing. Only after he returns wearing his bishop’s robes do they give him the time of day. Though worried about coming across as a broken record, there is a subtle distinction between the premises of these films. While The Exterminating Angel featured a cast that could not leave the house after having dinner, the protagonists of The Discreet Charm of the Bourgeoisie wind up having to move heaven and Earth just to have a chance of getting any kind of meal. Like many of Mr. Buñuel’s previous films, The Discreet Charm of the Bourgeoisie has a very surreal tone to it. In the cast’s ostensibly simple quest to have a decent dinner, it’s revealed that the world in which the film is set is far from logical. This allowed Mr. Buñuel to play increasingly elaborate jokes on the characters he created. Indeed, much the humor in this film is derived from the absurd and outright contradictory circumstances that prevent them from having dinner. At first, the setbacks are mundane enough; the Thévenots weren’t expecting guests that particular night, the manager of the inn died hours before, and the teahouse they visit is somehow out of every single beverage – there is not a drop of tea, coffee, milk, or herbal tea to be found. Things only get stranger from there with other aborted meals resulting from a group of French army officers spontaneously appearing and an overzealous police officer arresting everyone present. 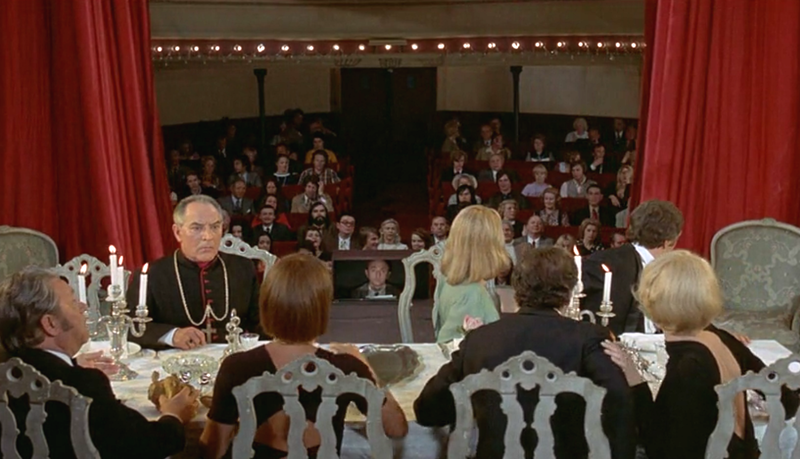 In what is perhaps the film’s signature scene, the group attempts to have dinner at a French colonel’s dining room only for it to turn out that it’s actually a stage and the guests are now suddenly actors and actresses in a play. “All the world’s a stage”, indeed. What makes these revelations particularly humorous is that every single one of them is accepted without question. When they learn their dinner is actually a stage production with a sizable audience, they don’t act as though they’re subject to an elaborate prank. Instead, they are horrified that they can’t remember their lines. Many of the stranger interruptions are eventually revealed to be dreams. Amusingly, one character dreams within another character’s dream at one point. Interestingly, many of them are based on Mr. Buñuel’s own recurring dreams. He would dream of being on stage and forgetting his lines, meeting a following his dead cousin into a house filled with cobwebs, and waking up to see his dead parents staring at him. In most stories, this would be an insufferable cop-out, but in The Discreet Charm of the Bourgeoisie, they complement the surreal tone of the story. It also provides a good explanation as to why characters just go along with everything. After all, haven’t you had dreams in which you accepted all of the absurd happenings without question? These dream sequences culminate in a scene wherein the characters are ruthlessly gunned down by a group of terrorists. In a display of gallows humor, Rafael attempts to sneak food from the table. He is determined to finish the good meal if it kills him, taking the cliché to its literal extreme. When he is killed, it turns out this too is a dream. Fed up with the constant interruptions that seem to span multiple realities, Rafael settles for eating a meal consisting of various leftovers in his refrigerator. 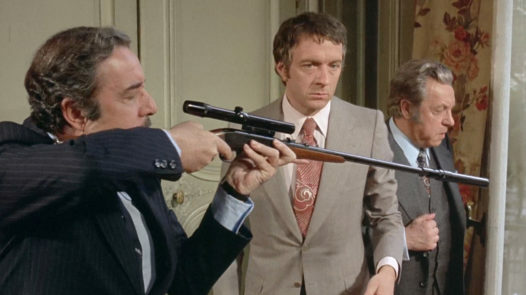 Having fulfilled this humble goal, the film ends in classic Buñuel fashion – by coming to a dead stop. What I find remarkable about how The Discreet Charm of the Bourgeoisie tears into the behavior of the upper-middle class is that it’s written from a perspective of bemusement rather than anger. The effect it has on the story is quite profound, having a bit more applicability to it than the product of an embittered filmmaker, which can almost always be traced to the time period that spawned it. More importantly the critique is subtle enough that the story is allowed to exist on its own terms. If you’re looking for a film with a particularly sophisticated, erudite sense of humor, The Discreet Charm of the Bourgeoisie a recommended watch. Even if you don’t fancy yourself a fan of arthouse films, it is worth a try. The film goes in so many bizarre directions that by the end, you can’t help but be amused by the insanity. In fact, the increasingly strange circumstances in which the characters find themselves are surprisingly relatable despite their rather vain personalities. I’m sure we’ve all had those times in which we tried to accomplish a simple task only for increasingly unlikely interruptions to come barging in like a bull in a china shop. It’s a product of a talented filmmaker brimming with the many personal touches that allow his work and style to stand the test of time.